We thought it would be fun to take a look at an actual child of one of our nation’s Founding Fathers and see. 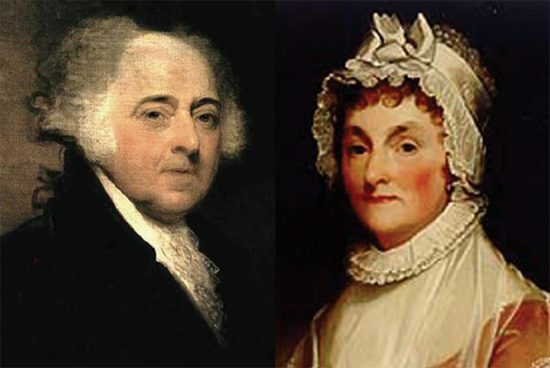 We chose John Quincy Adams (JQA), the son of President John Adams and First Lady Abigail Smith Adams. John Quincy Adams was born on July 11, 1767, in the village of Braintree (now Quincy), Massachusetts. Let’s dive into some facts! The colonies had not fought and won the Revolutionary War to gain their independence from Great Britain. But there was much unrest in the colonies. The Boston Massacre (1770) and the Boston Tea Party (1773) were both on the horizon. Johannes Chrysostomus Wolfgangus Theophilus Mozart was 11 years old and his first opera, "Apollo et Hyacinthus," premiered in Salzburg. The average journey across the Atlantic Ocean took 7 weeks. Most people wore their hair very long. Women and girls kept their hair covered with hats, hoods, and kerchiefs. Men and boys tied their hair into “qeues” (ponytails) until wigs came into vogue (mainly in the port cities). Owning land was the main source of wealth and Americans grew their own food and ate a great deal of corn — roasted, boiled and cooked into cornmeal bread and pancakes. Many kids did not go to school or learn to read and write. While most children living in New England went to school for at least a short while, children living in the southern colonies went to school less frequently. Boys had more schooling than girls. The thinking of the day was that girls only needed to learn to cook and how to raise children. Most boys and girls, certainly in frontier areas, learned how to plow, mend fences, skin animals, dress meat, fish, shoot, hunt, and ride. Because the water was pretty dirty in the late 1700’s, many people drank cider, beer, and corn whiskey—even the children! There were laws that prohibited educating African Americans. A fear was that they would learn to read the Bible. Typical kids’ games were “tag,” “blindman’s bluff,” “Here we go round the mulberry bush,” and “London Bridge.” Boys played ball and girls played with dolls made of rags and corn husks. In the winter they sledded, and in the summer they swam. At 12 or 13, most boys took an apprenticeship, where they learned a craft or trade from a cobbler, barrel-maker, tanner, fisherman, or other skilled artisan. Side Note: JQA’s middle name is pronounced Quinzy not Quintsy. Now, What was JQA’s life like? He was taught arithmetic, reading, languages, etiquette, and to read the classics mainly by his mother. In 1775, when he was 8 years of age, his mother took him to the top of Penn's Hill, near their farm, and there they watched the fires of Charlestown and heard the cannons roar from the Battle of Bunker Hill. In his early years his father was frequently absent from the home as he was attending the Continental Congress, helping to write the Declaration of Independence and overseeing the Revolutionary War. JQA was the eldest son so while his father was away, he was responsible for the care of his mother and younger siblings. He feared for his father’s life. As a signer of the Declaration of Independence, his father could have been arrested as a traitor to the British crown. This could also mean that his family could at any moment, be captured and held hostage. At the age of 10, JQA accompanied his father as he served the country as special envoy to Paris. Over the next seven years, John Quincy spent time in Paris, the Netherlands, and St. Petersburg, with visits to England, Sweden, and Prussia. As a result of these visits, he became an accomplished linguist. On this trip abroad, the young pre-teen began keeping a diary – a diary he maintained for almost seventy years until his death. The young JQA experienced his first formal schooling at the Passy Academy outside of Paris where—together with the grandsons of Benjamin Franklin—he studied fencing, dance, music, and art. At age 14 he left his father in Europe and traveled to St. Petersburg, Russia to serve as private secretary and translator to the American minister to Russia who, it turns out, could not speak French (the language of diplomacy at the time)…or even Russian. Later, having barely received a structured education of any kind, he began attending the University of Leiden while his father was a diplomat in Holland. He remained here for about a year. At age 16 he again traveled to Paris to serve as secretary to his father, who was negotiating the Treaty of Paris. During this time, John Quincy attended schools in Europe and became fluent in French, Dutch and German. In 1785 (at age 18), he entered Harvard College and graduated in 1787 (at age 20). At age 58 John Quincy Adams becasme our 6th President of the United States. On one of JQA’s early trips to Europe with his father he experienced a harrowing crossing of the Atlantic. The ship was struck by lightning (killing four of the crew), barely survived a hurricane, and fought off a fleet of British vessels. His next journey across the Atlantic was not much better! The boat sprang a leak and John Quincy and the crew had to man the pumps as the unseaworthy vessel limped to the Spanish coast. Then it took his party two grueling months to get across Spain and France to finally reach Paris.